Our Thriller of the Month for September. With a premise so deliciously sleek, you wonder how it hasn’t been arrived at before, Our House is a twisting odyssey of suburban betrayal. When Fi Lawson arrives home to find strangers moving into her house, she is plunged into terror and confusion. She and her husband Bram have owned their home on Trinity Avenue for years and have no intention of selling. How can this other family possibly think the house is theirs? And why has Bram disappeared when she needs him most? 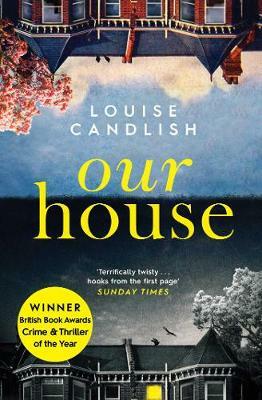 With a premise so deliciously sleek, you wonder how it hasn’t been arrived at before, Our House is a twisting odyssey of suburban betrayal, masterfully unspooled by Candlish who effortlessly stays several steps ahead of the reader. This book with leave you with your mouth wide open! An ending that you definitely will not see coming.